The leather is so hard and stiff that it does not bend with the body. 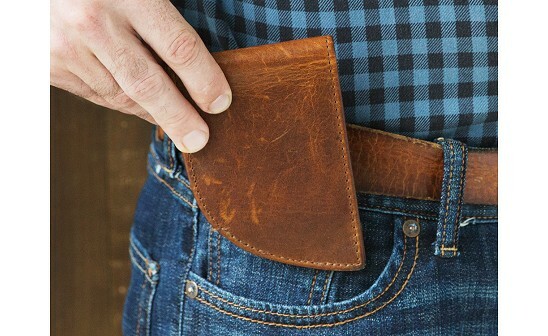 The wallet is really too large for a front pocket. It shows through fabric in dress slacks and jabs the wearer badly in jeans. Don't bother. Bought it for a Christmas gift for my husband and he only used it for 2 days. He says it is too bulky in his front pocket and is uncomfortable. We both are very disappointed. 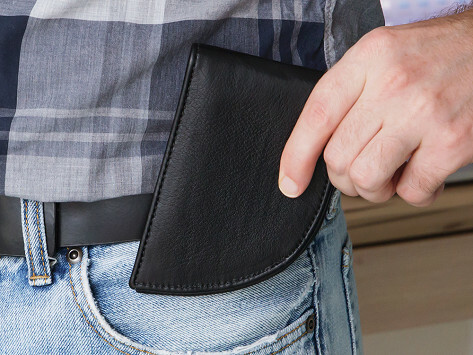 Currently, your front pocket Bison leather wallet cannot be purchased in black - from Grommet. And it sells for 50.o0. Yet, I just purchased one, in black, from Amazon for 40.00. And Rogue Indusries is the manufacturer. Why the cost differential? My husband did not like the feel of this wallet in his front pocket. Considering how expensive it was, we had to return it.